On the transport tab of a customer invoice window, there are two methods for managing boxes. To use this method you should not turn on the preference mentioned below. You simply click twice (slowly) in the box numbers column of the “Transport details” tab on a customer invoice and enter box numbers. 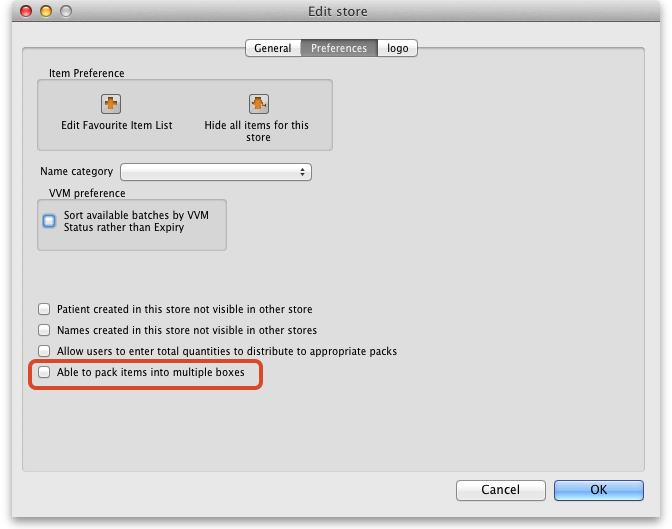 The rest of this chapter assumes you're using mSupply with this preference checked. Once you've created a customer invoice, and picked goods, the pickers should have marked the pick slip with what quantities of each item were put into what box. Now go to the Transport tab of your customer invoice. 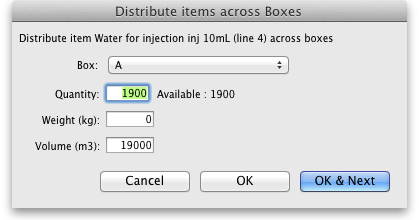 Type a box name, click OK & Next (shortcut: the Enter key) to add another box. On the last box click OK to save and close the window. If you're Gary, you might have clicked OK & Next one too many times. In that case you can use the Cancel button to close the window. Note that you can't have a blank box name, and you can't have two boxes on the same invoice with the same name (You can just use the same series of box names over and over on different invoices). If you make a mistake with a box name you can double-click a row to edit it. Click OK to close the Box Management window when you're done. In most cases you will be able to put the total contents of an invoice line in the one box. In that case, click on a row, or hold down <control> (Windows) or <command> (Mac) and click on multiple rows. In the example below we have highlighted rows 2, 3 and 4. Choose the box for the items from the drop-down list. You'll see the boxes column in the list has been filled out. If you have bulky invoice lines or large quantities, you will need several boxes to hold the one line. 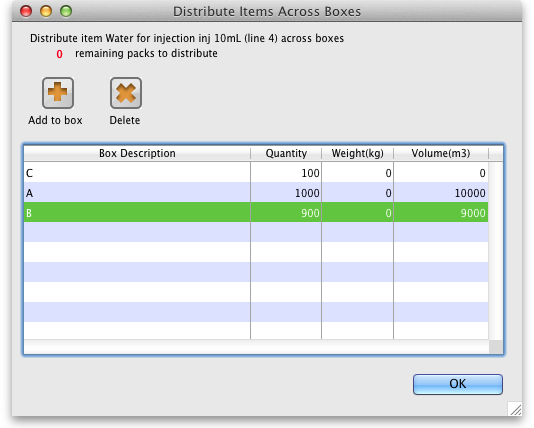 Double-click the line to assign to boxes. Notice that at the top of the window “1900” is in red. That's the quantity still to distribute. Click the Add to box button. Fill out the window to enter 900 in box B and click OK to close the window. You can double-click a row to edit it. 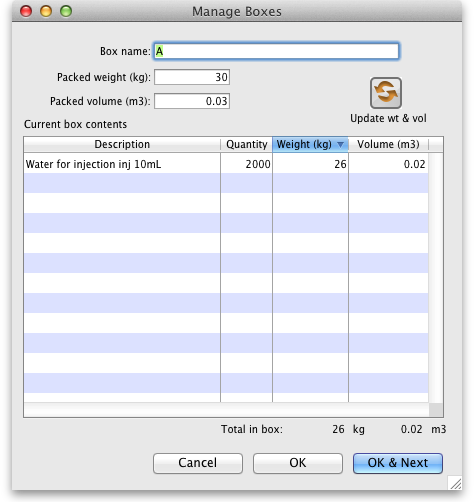 Note that the weight and volume for the item will be calculated automatically if you have set them in the item details window, but you can also override the calculated weight/volume when you are assigning an item to a box. 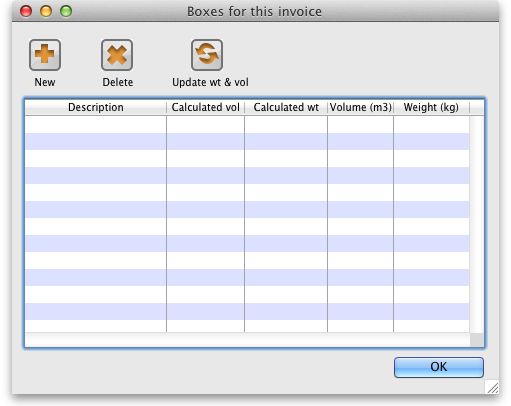 You can use the Unbox button to remove an invoice line from all boxes at once. Highlight one or more invoice lines. 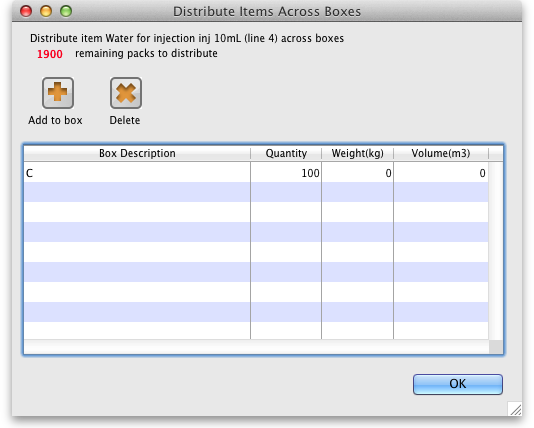 If you click Manage Boxes and then double-click a box you will be shown a list of items in that box. We have custom printing forms available that will print packing lists for each box. Ask us for more details.